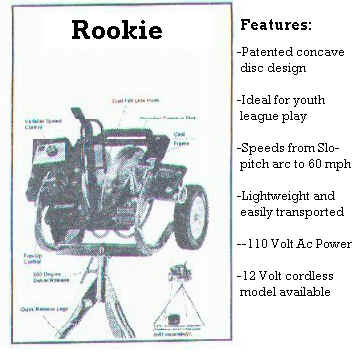 Pricing on Pitching Machines Subject To Change. Please Phone For Price !!! with the increased radial surface contact offered by ATEC'S patented Concave Disc design. using the tripod leg as a convenient tow handle. 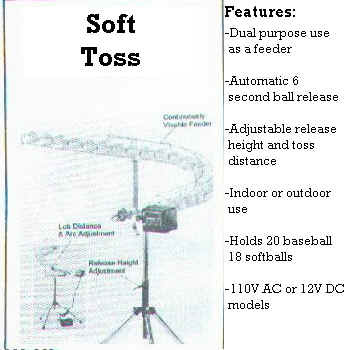 transport and versatility of use makes it ideal for fielding drills as well as hitting practice. 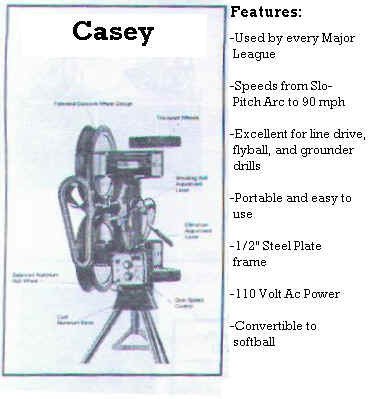 powder coat finish, the Casey will perform for you year after year. variable speed control your practice becomes more productive. Casey II, converting one to the other in less than 60 seconds. 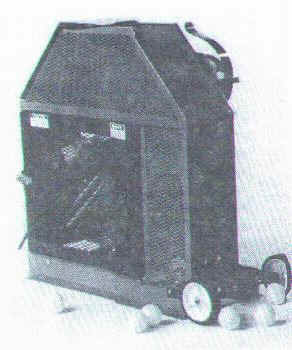 At only 65 lbs., this machine is simple to carry and fits easily into your car trunk. 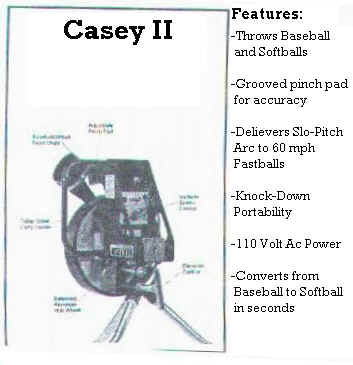 fly balls for fielding practice make the Casey II a great choice in practice partners. far as a regulation ball while eliminating the fear factor of being hit by a wild pitch or a hard ball. And it can be used safely indoors or out. 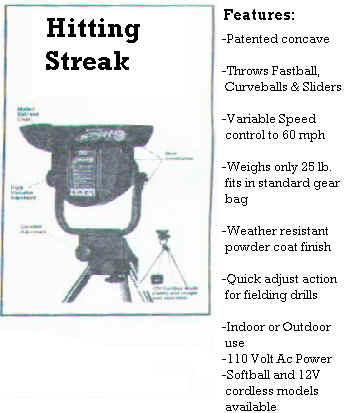 No machine develops hand speed and timing more effectively than the Hitting Streak. equivalent to a 90 mph pitch! extra coach on the field. developed hand/eye coordination, timing and bat speed. maintain a high level of performance. And it takes only minimal space (12" x 12"). hitter. No other drill teaches a player to wait on the ball as well. for pre game warm up. 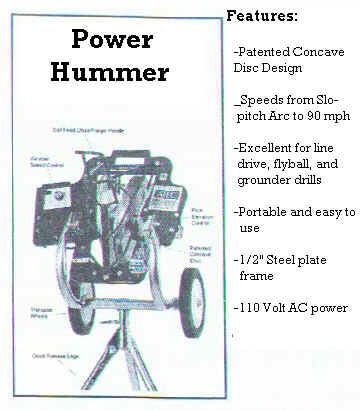 The 12V cordless model offers up to 4 hours of continuous use. 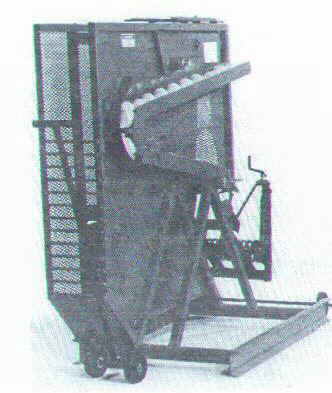 Can throw over 60 m.p.h. Remote control with 80' cord. Can throw over 80 m.p.h. specify baseball or softball when ordering. baseball or softball when ordering. 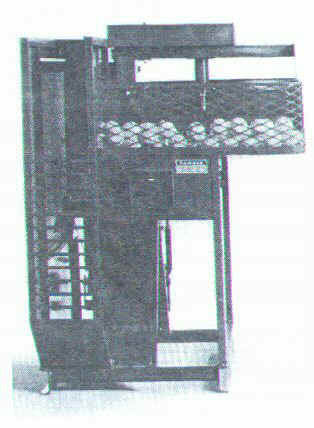 special reinforcement to protect machine from batted balls.